My Little Craft Things: Frilly and Funkie - Bring on the Bling! It's time for another wonderful challenge over at Frilly and Funkie! This time Jenny is our lovely hostess and she has chosen the theme BRING ON THE BLING. Be it diamonds, pearls or even glitter we need to see some sparkle on your projects. Don't forget, one lucky winner will receive a $25 gift certificate to Linda's shop The Funkie Junkie Boutique! Here is my take on the bling. 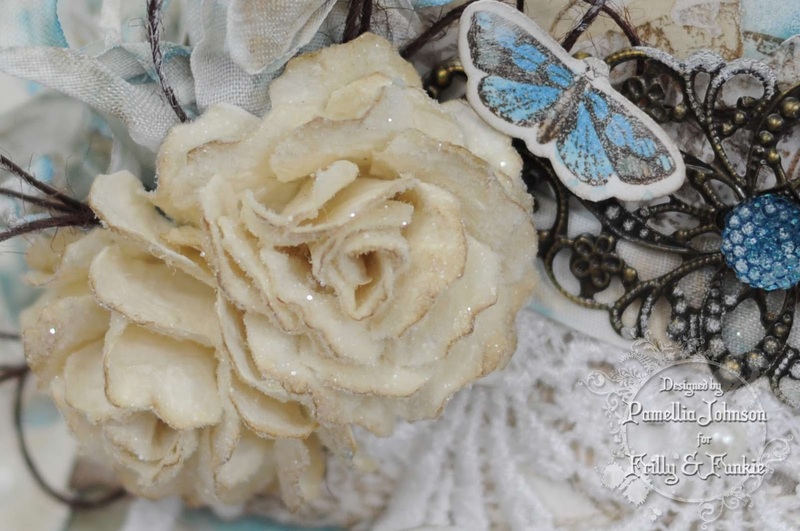 My shabby roses are cut from Tim Holtz Sizzix Tattered Florals, coloured with Antique Linen and Walnut Stain, Coated with Glue N Seal and Rock Candy distress glitter. 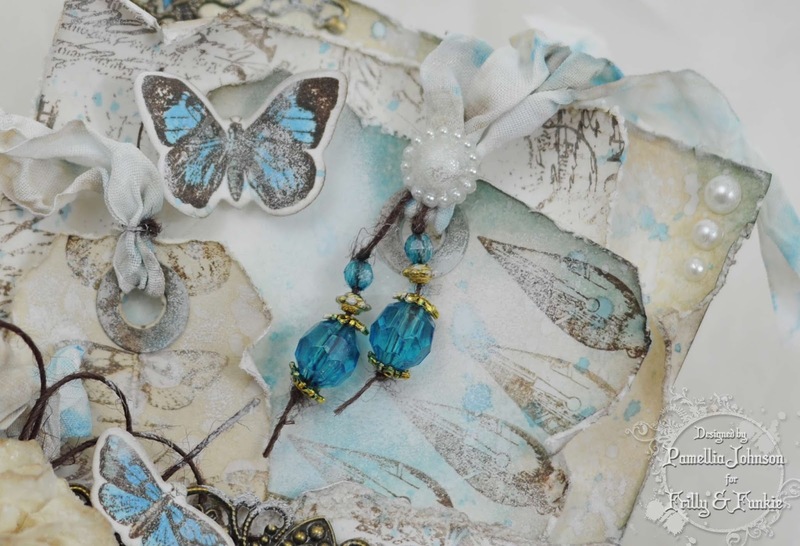 The butterflies are stamped with Tim Holtz French Flight using Ranger Wendy Vecchi Potting Soil and then I coloured them with distress markers Broken China and Salty Ocean. The beads are pulled off a Spellbinders Rosary chain set and coloured with Alcohol ink Stream. The Tim Holtz Mirrored Stars were also coloured with Stream. The pretty pearl button is coated with Rock Candy distress glitter. 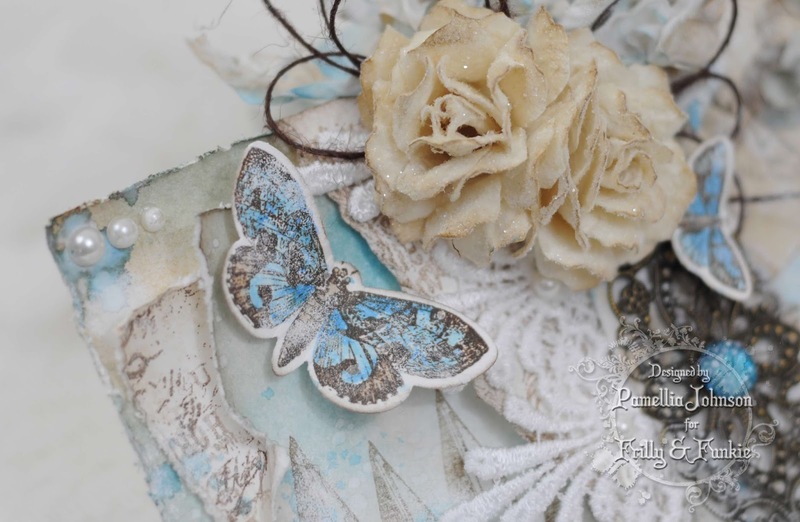 The shabby stamped layers include Tim Holtz Distress Damask, Stampers Anonymous Classics #19 and Tim Holtz Papillon. All were stamped with Ranger Potting Soil ink. 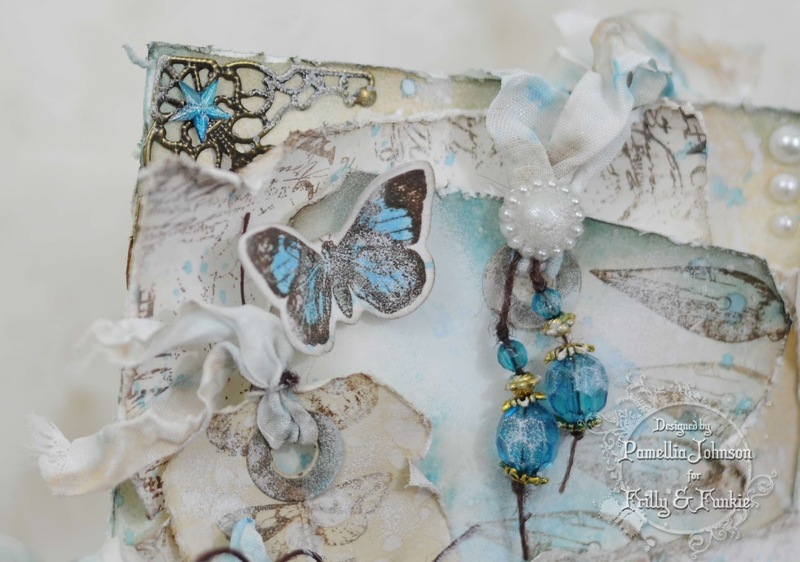 The wonderful bling in the center is a Tim Holtz Gumdrop and it is coloured with Ranger Alcohol ink Stream and centered on a wonderful large filigree flourish. All of the layers were treated with a combination of Picket Fence Paint, Salty Ocean, Frayed Burlap and Walnut Stain inks, Antique Linen ink and Salty Ocean and Picket Fence distress ink sprays. The seam binding was coloured with Salty Ocean and Frayed Burlap distress inks. A wonderful new creation Pamellia! AWESOME.. love this softness and all this perfection ...wow! Another stunner Pamellia, the frosting on the rose and he hints of blue really make it all come to life. Never fails to amage me how you can use so many elements and they all seem as though that's just how they were meant to be, if I tried the same it would be a perfect mess. Another stunning creation Pamellia. I love all your detailing, wonderful textures and gorgeous colours too. Loving all the detail and colors Pamellia, your flowers look real , great work ! Loving the blue, so very pretty! 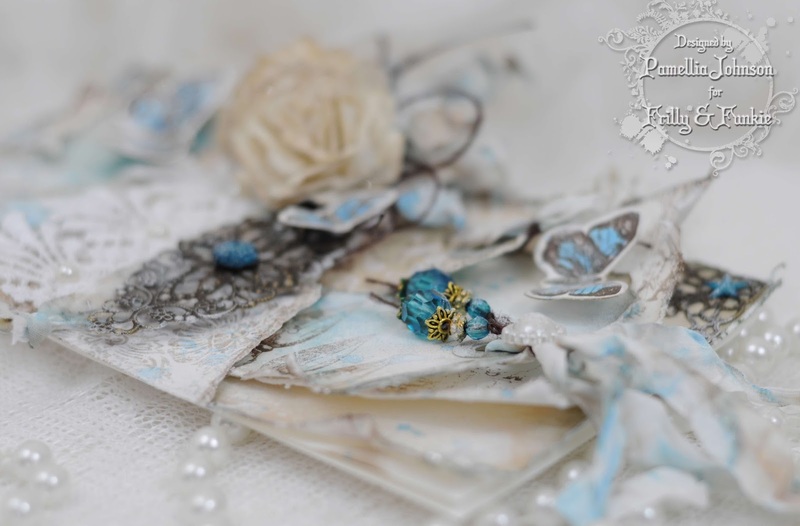 Everything about this is simply stunning and I am loving all the layers, the hidden elements, your shabby roses, the bead charms, filigree and lace. This is definitely a frilly piece with bling. Lovely colors, lace, florals and shiny BLING! A fabulous project, love all the layers and of course the bling. Absolutely lovely, Pamellia. I can imaging how much even more lovely it's in "live". Another super gorgeous tag Pamellia using the theme colour for our challenge this time at 613 Avenue Create. Thanks for sharing it with us and hope to see you there again soon. Another gorgeous tag love the shabby roses and all the bling in salty ocean . another of your superb creations today. I never get tired of looking at all the wonderful and superb elements in your creations. I bet if I stayed looking all day I would still find something wonderful I had missed out. Hello Pamellia!! SIGH!! The colours are so soft and lovely...blue is my second favourite colour...next to pink of course!!! As always your techniques are GORGEOUS and so very well done!! You are simply THE BEST!! Beautiful Pamellia, love all your detail with the touches of blue, lovely! Stunning tag, thanks for sharing it with us over at Creative Craft Cottage. What a beautiful project you created. Love the soft colours and your flowers are gorgeous. I'm not really a bling kinda gal but this is stunning. Oh, Pamellia I am inlove with your flowers! Stunning creation, as always! The color combination of blue and cream/brown tones I love the most! Yummy! I love the metal embellishments here! Gorgeous, my friend! This is gorgeous, Pamellia. Your flowers are a work of art... love the sparkle... so beautiful!!! So pretty! Love the blossoms and butterflies! Thanks for joint along with the Simon Says Stamp Monday challenge Pamellia! Fabulous, lovely butterflies and your roses are amazing. I love the filigree embellishment. There is so much bling and Gorgeousness here, Pamellia! LOVE the butterflies! Wow, you certainly have managed to bring on the bling! Fabulous card! My favourite bits are those shabby roses, - they look fantastic!! Hi Pamellia, this is Shabby at it's finest!!! I looove those roses, and the layering is perfection. Stunning as always Pamellia, I never cease to be amazed when I visit your blog - there is always something beautiful to find, such lovely pastel colours and fabulous attention to detail. Yet another gorgeous creation, Pamellia! I love the beautiful blues and browns, and those shabby roses are amazing. Layers and layers of loveliness. The roses are absolutely divine. I'd say good luck with your challenges but I don't think that luck will come into it lol! Wow Pamellia this is so incredibly beautiful, bet you have heard that before, lol, seriously this is outstanding design work, the colours, the embellishments all look stunning, those flowers are especially awesome, I am learning to be a bit more bolder with my design work thanks to the awesome creations you make. Gorgeous!! I love the sparkle and bling you've added and it's so subtle ... Thanks so much for your comments too ... As for the smooshing ... I just dab ink pads onto a large acrylic block, spritz with water and lay my card on top giving it a 'smoosh'. I find it works better with either glossy or smooth card. Gorgeous...love the pops of blue! This is beautiful and perfect for our ribbons and lace challenge over at Polkadoodles this time. WOW this is stunning Pamellia! I love the gorgeous cream flowers and the butterflies are beautiful... fabulous textures as always!! Another AMAZING make, so beautifully made in every way. Your flowers are gorgeously gorgeous so is the bling. This is just gorgeous Pamellia, love the shabby/chic in those shades and the 'bling' is fabulous. p.s. Thanks for sharing with us at FSC too. Wow, Wow, Wow! Another breath taking flower arrangement complimented by the most amazingly put together background! Those roses defy words! And each and every embellishment gorgeous and thoughtfully placed. Love the color combination! Pamellia, you have done it again; I am in awe of your relentless imagination, creativity and skill! Hugs! Sparkly delight! What a fabulous creation again, Pamellia... you're unstoppable! Ooh I am totally swooning over this! 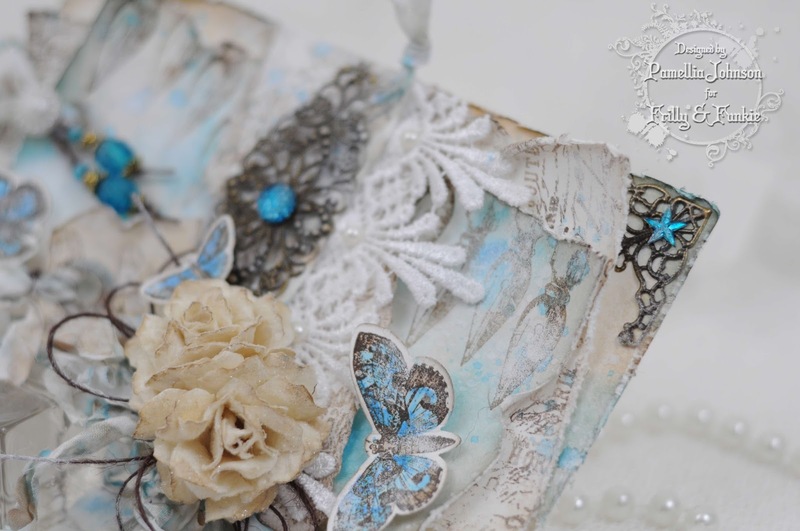 I love love love the butterflies, gorgeous colours and all of your stunning embellishments. 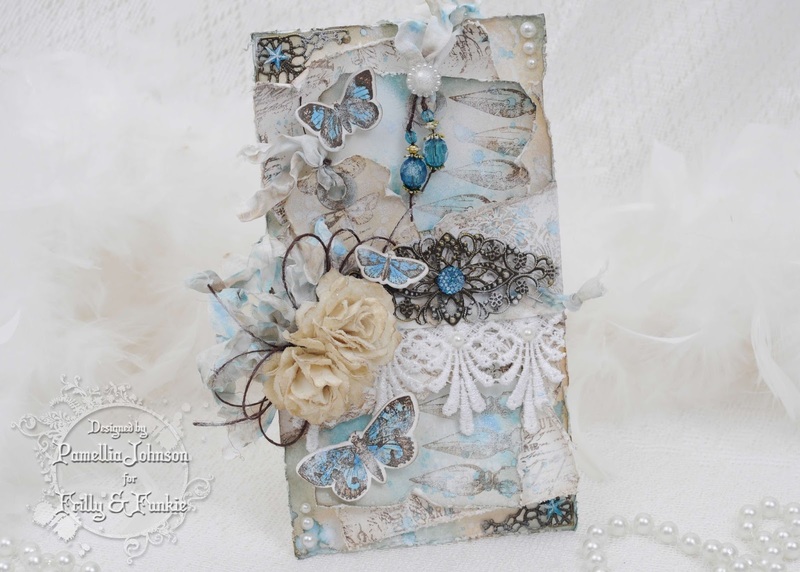 Lots of gorgeous embellishing here Pamellia, love how you have brought everything together, a fabulous card. A great card. The butterflies are very pretty and the touch of blue is lovely. Your coloured beads are a fabulous embellishment as is the filigree flourish. Sally.x. 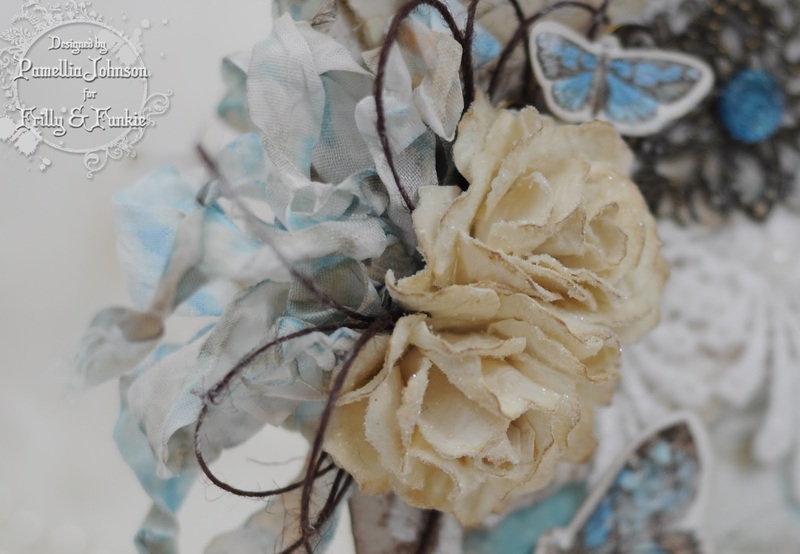 Blue and shabby flowers and butterflies ... These are jut some of my favourite things and they are all on your fabulous project. I LOVE it! I mean really, really love it. It's spectacular! Oh My FABULOUS!!! Love the colors as well as every single spec of beauty.....omg Love the Filigree!! So happy you joined in the Ribbons and Lace challenge at Fussy and Fancy!! Best of luck!! Goodness but this tag is gorgeous! 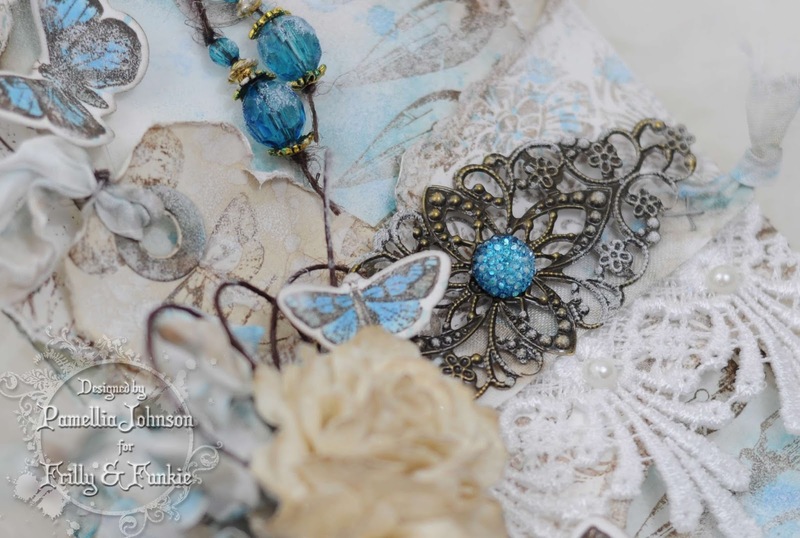 I love the wonderful cream, white and blue color palette and all the beautiful textures and layers. That gorgeous bit of bling in the center really grounds the whole piece, and then those roses....oh, swoon! They are sugared...and ultra gorgeous. Love the tiny string bows, love the itty bitty star in the upper left corner...just delight hiding in every nook and cranny! It's pure eye candy! Thanks for sharing with us at Really Reasonable Ribbon! I really like your project. Thanks so much for playing at RRR! See you next time!